1) This is the equation for momentum. 2) This is the equation for impulse. Derivation: How did we get Impulse from Momentum? 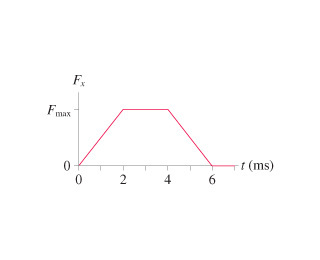 From this equation, we can also see that impulse is the amount of force acting upon an object in a given period of time. Types of Questions You Will Encounter and How to Approach Them! a.Relate mass, velocity, and linear momentum for a moving body, and calculate the total linear momentum of a system of bodies. By using the momentum equation. b.Relate impulse to the change in linear momentum and the average force acting on a body. Just use the impulse equation. If you have a collision, time, and a force in a problem, think’ impulse’. (1) Identify situations in which linear momentum, or a component of the linear momentum, is conserved. The momentum of an isolated system (no outside forces) is conserved in any interaction. (2)Apply linear momentum conservation to determine the final velocity when two bodies that are moving along the same line, or at right angles, collide and stick together, and calculate how much kinetic energy is lost in such a situation. a. Elastic: K.E. is conserved. b. Inelastic: K.E. is not conserved. 2D Collisions: If the two bodies are moving at right angles, then the vertical momentum is conserved and the horizontal momentum is conserved, so you can write equations for the conservation of momentum in the x and y directions.